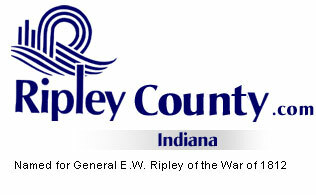 The Ripley County Council met on Tuesday, October 18th, 2005 at the Ripley County Annex in Versailles, Indiana. Don Dunbar, Council President called the meeting to order promptly at 7:00 PM with the pledge allegiance to the flag. Council Members Dephane Smith, David Simon, Mark Busching, Ben Peetz, Edward Armbrecht, Donald Dunbar & William Dramann were in attendance. Council Member Smith made the motion to approve the minutes of the September 18th, 2005 meeting seconded by Council Member Busching. Motion approved unanimously. Council Member Smith made a motion to approve the additional appropriation for Robert Reiners/Ripley County Commissioner/ Highway Department of $150,000 from EDIT Fund #278-32520-000-278 (Bituminous) seconded by Council Member Simon. Motion approved by four (4) Council Members Smith, Simon, Dunbar & Peetz. Council Member Dramann abstained & Two (2) Council Member voted against Busching & Armbrecht. Council Member Armbrecht requested that the minutes reflect that the EDIT Plan has not been amended and the money has been spent prior to the approval of the appropriation. Council Member Dramann made a motion to approve the additional appropriation for Pat Thomas/Health Department for $4,000 Fund # 331 Master Settlement/Contractual Services seconded by Council Member Simon. Motion approved by Five (5) Council Members Dunbar, Simon, Smith, Peetz & Dramann. Council Members Armbrecth & Busching voted against. Council Member Simon made a motion to approve the additional appropriation for Ripley County Park & Recreation of $1,250 Fund #425-38710-000-050/ Special Event Expense, $1,250 Fund # 425-33370-000-050 Electric, $2,500 Fund # 425-36103-000-050 Repair & Maintenance & $1,500 Fund # 425-43101-000-050/Park Accessories seconded by Council Member Smith. Motion approved unanimously. Council Member Simon made a motion to approve a transfer for Ripley County Park & Recreation of $83 from Fund # 425-36103-000-050 Repairs & Maintenances to Fund # 425-29620-000-050 Paper Products seconded by Council Member Dramann. Motion approved unanimously. Council Member Smith made a motion to approve a transfer for Mary Ann McCoy/Auditor of $4,375 from Fund # 100-32101-000-004/ Transfer Books to Fund # 100-11600-000-004/ Clerical (to Finish the new Transfer Books) seconded by Council Member Simon. Motion approved unanimously. Neil Comer, Ripley County Attorney presented a letter of Designation of Economic Development Area (ERA) in Adams Township and advised the council that the letter creates no obligation by the Ripley County Council, to confirm the resolution on November 15th, or thereafter. Council Member Busching made a motion to authorize Donald Dunbar, Ripley County President to sign the Letter of Designation of Economic Development seconded by Council Member Smith. Motion approved unanimously. Bill Neal, Ripley County Park Board updated the council members on the show mobile and how it is used in the Ripley County Area. Neal advised that the Ripley County Community Foundation (show mobile was funded by a grant from the Lilly Foundation) would like to see it used more in the county and advised expenses charged for the use of the show mobile is $650 in county & $950 out of county. Neal also advised that they are currently paying $500 in labor for the first day and $250 for the seconded day. Neal is requesting that the county subsidize the use of the show mobile for the use in Ripley County at approximately $500 for non profit groups and advised that per Mrs. Morris, Ripley County Community Foundation Director that they are still holding grant monies for 2005 from the Endowment Fund. McCoy, Ripley County Auditor advised the Council of the research on this project in the past years of $300 for each time the Show Mobile was used in the county by Non Profit Groups and that we have a grant from the Endowment Fund that has not been designated from this year. McCoy also advised that we currently have two Endowment Funds with past funds in them and asked that the council consider depositing the current years grant in this fund. Council Member Simon made a motion to subsidize the Show Mobile seconded by Council Member Smith. Motion approved unanimously. Comer, Ripley County Attorney advised that the Chairmen appoint a board to work with Mr. Neal on getting a recommendation back to the Council. Dunbar, Council President appointed two (2) Council Members (Armbrecht & Smith) to work with Mr. Neal on this project. Council Member Armbrecht made a motion to get the Endowment Check from the Mrs. Morris/Ripley County Foundation and deposit into Endowment Fund 611 seconded by Council Member Busching. Motion approved unanimously. Tad Brinson, Area Planning Commission had questions about the fee schedule and collection of fees for Ripley County. Council Member Armbrecht made a motion to have the Area Planning Commission continue to operate as it had in the pass years seconded by Council Member Busching. Motion approved unanimously. Mary Ann McCoy, Ripley County Auditor presented a requested of $4,900 for bookbinding of transfer books in the Auditors office. Council Member Armbrecht made a motion to get another quote for bookbinding and see if any one else needs book binding seconded by Council Member Smith. Motion approved unanimously. Council Member Busching made a motion to change the mileage rate to .40 and contingent with the State of Indiana effective October 1st, 2005 seconded by Council Member Armbrecht. Motion approved unanimously. Council Member Busching made a motion to adopt the Resolution Electing to Enlarge Participation in the Public Employees’ Retirement Fund for the Election Board Member, Ginger Bradford, Clerk of Ripley Circuit Court seconded by Council Member Armbrecht. Motion approved unanimously. Mary Ann McCoy, Auditor Ripley updated the council on the report from the state that had to do with the 2003 payable 2004 & 2004 payable 2005 data. McCoy also advised that the data needs to be compliant in 2006. Commissioner Reiners advised the council that they had received information from IDEM on the testing of the monitoring well. IDEM will add some more monitoring wells at their expense. Economic Development –Edward Armbrecht-advised a company is looking at the Old Shoe Factory in Osgood and meeting with the People/Town Board Members in Osgood to put a package together/ advised that county needs to look at creating an Industrial Park. Technology Committee – Edward Armbrecht –not at meeting-Vollet advised Tech Committee approved the purchase of an industrial shredder out of the Riverboat Fund. Grant Committee-Donald Dunbar – Kelly Vollet- has a grant out for this round. Solid Waste District – Donald Dunbar – Meeting Thursday Night, Oct.20th. Welfare Committee- William Dramann-Has Report for review. Council Member Smith made a motion to adjourn until the next regular meeting on Tuesday, November 15th, 2005 @ 7:00 PM seconded by Council Member Dramann. Motion approved unanimously.